here is a picture of the bios,,,, check out the characters of the last line, "hdd firmware"! 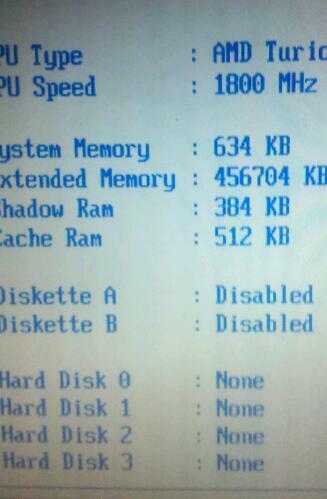 this picture of the bios shows diskette a and b disabled??? what the heck? 2.Update BIOS. After Updating BIOS do step number 1 as above. maybe your sata port or power plugs are having prob . please reconnect your HDD and DVD drive. and even then if u r facing same prob then please go to the BIOS and pres the F9 button for changing Ur BIOS into Default mood. Possible to fix VisionTek Radeon HD 6950 Graphics card? OS and Applications on Same Hard Drive?